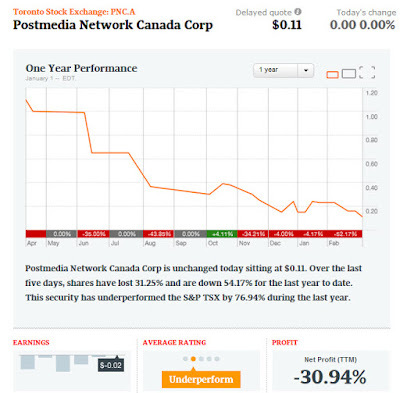 The word on the street this week is that Golden Tree Asset Management, the hedge fund that owns a big stake in Postmedia wants to sell its share. 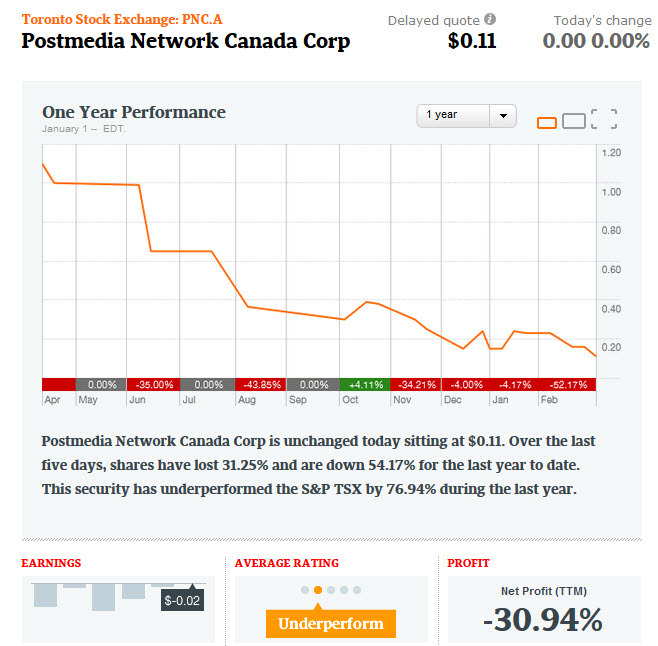 This doesn’t seem like a good sign for Postmedia, the National Post or the affiliated papers. Selling the shares probably indicates that Golden Tree is trying to monetize what it can, before bankruptcy. Shareholders come behind bondholders and other debtors in a bankruptcy proceeding, so it’s better for them to extract some value now, rather than get caught holding the empty bag, come Chapter 11 (or whatever legal phrase applies in Canada). Print media is in trouble all over. For example, Britain’s Independent is now independent of its paper edition, falling back on a web only, in the past month or so. But Postmedia is a special case. It has huge debts (half a billion dollars plus), and it is doubtful whether restructuring will ever be sufficient to generate the sort of cash flow needed to keep it afloat for long. There is a certain irony there. The National Post has made a living (such as it was, as there were very few profitable years) scolding governments and the general public for their profligate ways, in terms of debt. Meanwhile, management buyouts, takeovers and related shenanigans resulted in the company being saddled with a huge and impossible debt. So what will the result be? I hope that the local papers can be saved (or re-booted) by local people. There are a lot of big cities that will be without a daily paper, if and when Postmedia folds, otherwise. That would be a shame. There is still a lot of good in the local newspaper concept. I will continue to get the local (Edmonton Journal) Postmedia paper, even though the political cartoonist’s anti-Notley and anti-Trudeau ways can grate on me, until it goes away. If a new Journal rises from the ashes, I will probably give it a try. I suppose that we will find out, one way or another, pretty soon.